Wheat – dieticians suggest that children who’ve already had problems digesting oats should not have wheat until they are a year old. If your baby has been fine with oats and rice, you can introduce wheat at around eight months. Shellfish – can cause strong allergic reactions in children and should not be offered until 24 months of age. While all this seems a little frightening, it’s a fact that children exposed to new foods on a regular basis are likely to grow up as more adventurous and happy eaters and cooks. The way to accustom your little one to a new food is to use the 4 Day rule. This means giving them a new food with familiar foods and then waiting four days to see if there is any kind of reaction. So if you try puréed artichokes on Monday, don’t introduce another new food until Thursday. This allows you to pinpoint any reaction immediately. Older children are inclined to move into ‘faddy’ eating and often need to be encouraged to try new foods. One good way to do this is to offer them exciting meals to prepare, because the fun of cooking is a good incentive to enjoy the food produced. This recipe for ‘super-power’ pancakes gives them the enjoyment of pancake tossing while introducing ingredients that are ‘super-powerful’ in terms of nutrition such as spinach and low fat chicken. Make sure your children know that it’s vital to prevent bacteria which live on raw chicken from contaminating other foods. Show them how to wash their hands and cooking equipment in warm soapy water before touching other ingredients. Preheat oven to 200ºC. Mix herbs with a little black pepper and sprinkle over the chicken – allow children to roll the chicken breasts to press the herbs onto to the surface so they remain there during cooking. Now heat a dry frying pan over medium heat with half a tablespoon of water and add spinach. Cook, stirring until bright green and wilted. This is a good lesson in how heat changes the nature of an ingredient. Put spinach in a colander and leave it to drain. Clean the frying pan and heat it again to medium temperature with a tablespoon of olive oil – use it to fry the chicken, turning it over so it browns on both sides and the transfer to a dish in the oven for fifteen minutes until cooked through. This is a good time to use a meat thermometer to test if the breast is fully cooked which teaches children how to cook meat safely. Now sift flour into a large mixing bowl and add the other pancake ingredients, plus the drained spinach and mix well. Once again clean the frying pan, add half the remaining oil and reheat. Pour a tablespoon and a half of the pancake mixture into the hot pan and swirl gently to spread (children can do this once they’ve seen you do it the first time). Cook the pancake until bubbles rise to the top and then flip it over – it probably won’t be suitable for tossing because of the spinach, but you can always try – and then cook the other side until golden brown. Slide onto a plate, and keep warm above the oven. 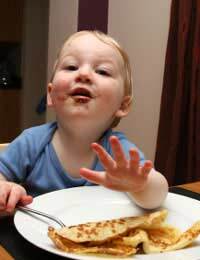 Allow children to garnish a stack of pancakes with leaves like celery or basil, a tiny spoonful of Ricotta cheese sprinkled with flakes of red peppercorns, or thinly sliced orange zest. Put the chicken alongside and serve.